One of the many challenges that people face when adopting a Paleo diet is dealing with the confounding factor of additional food sensitivities. Sometimes these sensitivities are known (perhaps you had allergy testing done at some point or react so violently to certain foods that it was a no-brainer). Sometimes these sensitivities are unknown and make it frustrating when we don’t experience the instant improvements to our health touted by so many Paleo enthusiasts. One such sensitivity is FODMAP-intolerance (also referred to as fructose malabsorption). This isn’t a food sensitivity in the sense that there is any sort of immune reaction to these foods. Instead, it is a case of a person who cannot properly digest the fructose (and longer sugar molecules containing fructose) in these foods. The term FODMAP is an acronym, derived from “Fermentable, Oligo-, Di-, Mono-saccharides and Polyols”. FODMAPs are short chain carbohydrates rich in fructose molecules which, even in healthy people are inefficiently absorbed in the small intestine. I know you’ve heard the limerick “beans, beans, the magical fruit…”; the punchline refers to the large amount of FODMAP carbohydrates in beans (or any of other vegetable that has a reputation for being “gassy”) that are only partially absorbed in the small intestine. When this excess fructose enters the large intestine, which is full of those wonderful beneficial bacteria we love so much, they feed the bacteria allowing for overgrowth of bacteria and excess production of gas. The presence of FODMAPs in the large intestine can also decrease water absorption (one of the main jobs of the large intestine). This causes a variety of digestive symptoms, most typically: bloating, gas, cramps, diarrhea, constipation, indigestion and sometimes excessive belching. In individuals with FODMAP-intolerance, a far greater portion of these sugars enter the large intestine unabsorbed, causing exaggerated symptoms. In fact, some researchers believe that Irritable Bowel Syndrome is purely a case of FODMAP-intolerance 1,2. Carbohydrates, which are just chains of sugar molecules, are broken down into individual monosaccharides (a single sugar molecule) by digestive enzymes in the small intestine (actually, this sugar digestion process begins with the salivary amylase enzyme in the mouth when you chew, but it continues all the way through the small intestine). Monosaccharides are then absorbed into the blood stream by first being transported through the cells that line the small intestine, the enterocytes. Enterocytes have specialized transporters, or carriers, embedded into the membrane that faces the inside of the gut. These carriers bind to specific sugar molecules and transport them into the cell (where the cell can either use those sugars for energy or transport those sugars to the other side of the cell where they can easily enter the blood stream). FODMAP-intolerance may be due to lack of digestive enzymes required to break longer chains of carbohydrates down to their individual monosaccharides and/or due to an insufficient amount of these carbohydrate carriers, specifically the carrier called GLUT5, which is the specific carbohydrate carrier for fructose (why this is also called fructose malabsorption). FODMAP-intolerance means that large amounts of dietary fructose and longer carbohydrate chains that are rich in fructose are problematic. These longer, fructose-rich carbohydrate chains are called fructans (inulin, which is a type of fiber, is also rich in fructose and problematic for those with FODMAP-intolerance). Sugar alcohols, called polyols, (sorbitol is an example) are additionally problematic because these sugars have the ability to block GLUT5 carriers (and if you’re working with a deficiency, that’s really not helpful!). Why do some people develop FODMAP-intolerance? Researches don’t know yet. It may be a reaction of the body to high fructose and fructan consumption with the Standard American Diet. It may be a side effect of a very distressed and/or leaky gut. There are also very likely to be genetic factors at play. The good news is that, for many, as their gut and bodies heal, their ability to digest and absorb these sugars improves. When it comes to modifying your diet to address a suspected FODMAP-intolerance, dose is the key. The type of FODMAP may be important for some people. Some people are more sensitive to the fructose and polyols (due to GLUT5 carrier deficiency) while some are more sensitive to fructans (due to digestive enzyme deficiency). Some people are sensitive to both. How much you can handle is very individual and is likely to change as your gut heals. There are medical tests available to diagnose fructose malabsorption, however an elimination diet approach is more reliable. Research has shown that the removal of FODMAPs from the diet is beneficial for sufferers of irritable bowel syndrome and other functional gut disorders 1. As you can see from this table, many of the moderate to high FODMAP foods are foods that we typically increase consumption of when adopting a Paleo diet. How frustrating for those who experience an increase in gastrointestinal symptoms when they adopt a Paleo diet compared to so many who find instant alleviation of symptoms! If you suspect (or know you have) FODMAP-intolerance, I recommend eliminating all food sources of FODMAPs from your diet for a couple of weeks. If you are sensitive, you should notice a fairly dramatic effect on your digestive symptoms. You can try reintroducing some of the lower FODMAP fruits and veggies and see if your symptoms return. 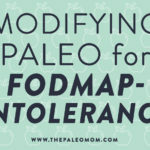 In many cases, following a gut-healing protocol (as outlined in this post, this post or in the book Practical Paleo) will improve digestion of FODMAPs and they can be reintroduced carefully but successfully. I read your post with interest because a friend was just mentioning her 2 1/2 year old twins probably have FODMAP issues. I’m a bit confused though – if the problem is fructose (as opposed to fructans) then what should people do about the fruits on the ‘safe’ list in the table? I’m very new to all this and still trying to wrap my head around it all… [I don’t have FODMAP intolerance, but I’m trying to break a VERY strong fructose addiction and am very sensitive to it so I know that nuts, all fruits, some veg (eg beets, sweet potato, tomato) and coconut products (apart from the oil) are a no-go for me. Just wondering why some of those things would be ok for someone who is fructose intolerant? The fruits on the safe list are fruits that are either quite low in overall sugar (so you’d have to eat tons of them to have a big dose of fructose) or fruits that are much higher in glucose than fructose. With FODMAP-intolerance, a low dose of fructose is usually okay because a little can be absorbed. There are likely some people who are so sensitive that they can’t even handle these fruits, however. Hi! I am 10 weeks pregnant and it has come up that I am deficient in the amino acid Tryptophan, and that is the reason for my constant nausea. My dr. suggested a supplement and said that it should help with the nausea but it hasn’t yet. Then, a friend told me she read in The Paleo Approach book that there is a link between FODMAPS and tryptophan absorption. It makes total sense because I’m even sicker on days where I eat apples and other fruit on the no list for FODMAPS. I can easily cut those fruits and other things out but here’s my concern: I’ve not been good AT ALL about eating Paleo since I’ve become pregnant. I’ve been very food adverse and NOTHING sounds good except PB&J, and other things that have bread and junk I know I shouldn’t be eating. I’m wondering how those things are affecting the tryptophan absorption. Any ideas? They could be. More importantly, they aren’t very nutrient-dense foods, so you’re probably not getting enough of a lot of things. The good news is that aversions are really normal this early and your body should have nutrient stores to burn though and it should be a whole lot easier to stick to Paleo once you hit the second trimester. In the meantime, you can try things like spinach or bananas by themselves which can help. But, even better would be to try and get some organ meat (maybe hide it in a smoothie or something? or do the frozen liver pill thing?) or seafood into you if you can stomach it. I think it really depends on the person, because I can’t anything with the littlest bit of fructose in it. You really just have to self-experiment to see what works for you. Great, great job! I was waiting for someone to write about this with clarity for a long time. By the way, I just found this website about chemical food intolerances called the “The Failsafe Diet Explained” (http://failsafediet.wordpress.com/). I find it interesting because people in the Paleo community don’t seem to talk about this. Did you konw about this? What do you think? Great! I look forward to read that. I’m interested because the Paleo diet hasn’t addressed some of my issues so I’m looking for other things that might be important for my healing process. This was really enlightening. And depressing. I have days when I experience painful bloating and gas. And there’s plenty on the avoid side of that chart that I do consume, some occasionally and some almost daily. Sigh…. I am very interested in the Paleo diet. I am gluten sensitive and have been trying to stay away from any foods that are not going to bring nourishment to my body. I was wondering why the Paleo diet doesn’t include legumes? Phytic acid binds to minerals in your food and makes them more difficult to absorb. I will hopefully have a post going into more detail about phytic acid sometime this fall. However, many people do tolerate occasional consumption of legumes (not peanuts), especially when traditionally prepared (typically sprouted and fermented), which reduces the amount of lectins and saponins. I typically suggest trying some time without (3-4 weeks) then reintroducing and seeing how you feel. Thanks for sharing this. I was just wondering if I had an increase in bloating and gas from cherries. Now I know I’m not crazy! Is that probiotics on the avoid side? I thought probiotics were safe! Sigh… I think I might have some of this because I notice a negative gut reaction when I eat fruits (my tummy starts to rumble) and I get very bloated with sugar. And, if I eat a lot of sugar, even from fruit like watermelon, my body starts to give off a smell like when you’ve had too much alcohol. This whole what to eat/what to avoid gets demoralizing sometimes. It’s more that probiotic supplements are often packaged with FODMAPs (like lactose) to help them survive the transit. This is highly dependent on the manufacturer, so just check out the ingredients list. Food sources of probiotics are still good (kombucha, fermented veggies, water kefir and even coconut milk kefir for some people). Well fermented veggies like sauerkraut are tolerated by man people who get symptoms from eating cabbage because all those good bacteria digest the FODMAPs for you before you eat it. I’m the same with sugar. Doesn’t seem to be FODMAP for me so much as SIBO. But, I get very bloated when I eat too much sugar. It’s frustrating! I’ve used Goodbelly products for probiotics without any problems! they’re vegan so no dairy. ok, this might be a dumb question, but what do the x’s mean? good or bad? little confused. But thank you for the great info! The big X’s mean there are no foods in that category. Thank you for this great post! I’ve been operating under the assumption that I had SIBO, but I didn’t realize the symptoms were similar to FODMAP symptoms. I haven’t found any relief following protocol for SIBO, so I think I’ll give this a try. The chart you posted is very helpful! Thanks so much for this post! I’ve come to the same conclusion after self-experimenting with the advice given in the old Dr. Atkins book. One day I looked up and realized I had ended up on a Paleo diet! Most people think I’m crazy for limiting my sugar as much as I do – because lots of fruit’s supposed to be GOOD for you! – but my body tells me time and again that it doesn’t like it. Now I have a name for it: Fructose malabsorption. Yup, sounds about right! Now, I am in a dilemma, and I hope you can help me. I just got braces! Ouch. And I would love to make some protein-rich smoothies and blended soups but don’t know where to start. I want to avoid sugar as much as possible – not only because my body is better of without it, but also because sugar feeds bacteria and you really have to watch that with braces. Any tips or ideas? I’d like to stay with real food (and preferably low-carb). I eat lots of kale already so I plan to blend that with my brand-new immersion blender and my homemade bone broth. Where I’m getting stumped is with the protein part. Creamed chicken? Creamed beef? Sounds so weird, but I’m hesitant to turn to protein powders. Also, any tips for low-sugar (protein containing) fruit smoothies? How do people get their protein in fruit smoothies? Sorry this post is so long! I really like how you delve into subjects and really try to understand and inform. Thanks in advance!!! The stereotypical Paleo protein powder is egg white protein powder (some people also use grass-fed whey protein, which you can get from Tropicial Traditions http://secure.ttpurchase.com/DAA28EEE-1E0B-90B3-0E8A77E197EA34C8 ). What I do for my husband is to make shakes with whole raw eggs. I typically add 3 eggs for protein, half an avocado or some coconut milk for fat, green juice or orange juice or more coconut milk for liquid, and banana, mango or berries for sweetness. Sometimes I add spinach too. I’ve been thinking about trying them with bone broth for liquid because that would also add some good protein, but I’m not sure he’s game. 🙂 Banana and avocado are an awesome combination as are mango and coconut milk. You could adjust the fruit to your needs (or even just go for a sweeter vegetable juice like carrot or beet). I hope this helps! I seem to have a problem with Coconut Oil. Could this have something to do with Fodmap intolerance? I saw that on the chart it’s listed as safe. Or could it be perhaps that I just need to use a tiny bit to get used to it and build my body to get used to it? I also am sensitive to coconut oil when I use it for cooking (tried it in my hot tea and it was like I’d poured in a laxative!). I take a capsule of virgin coconut oil from GNC and have had no problems, but would love to cook with it. I read on Mark’s Daily Apple that people who have this reaction have a gut that isn’t healed for other reasons (diet, etc). I plan to try this FODMAP plan and hope things improve enough overall that I can reintroduce coconut oil into my family’s diet. Thanks for the tip. I will check that out on Mark’s Daily Apple. This seems to be a common reaction (my husband has the same thing if he eats something with alot of coconut oil in it, although he’s okay with some). There’s also the possibility of an actual allergy to coconut, but I think an incompletely healed gut is a more likely possibility. I too have issues with Coconut Oil. I began taking spoonfuls of it as I read it is anti-fungal (my naturopath diagnosed me with Candida) but after several weeks I began noticing extreme racing heartrates. I didn’t make the connection till I asked my naturopath about it and he told me Coconut oil changes your absorption of calcium (can’t remember if he said it increases it or decreases it, I’d have to ask him again) He said stop Coconut oil immediately but it took several weeks for the extreme heart racing to go away. I won’t ever use it again, and I’m even leery of making my own coconut milk, which I’d love to do since it’s so economical and I want to cut out using commercial soy milks. Guess it’s just almond milk for me! I have had indigestion all my life. Eating was a minefield. Finally, thyroid issues were discovered. Addressing that alleviated some of those symptoms. But there were more. Not too long ago I gave up gluten and dairy. While I don’t adhere to the Paleo diet, I do restrict grains. That initially helped a lot, especially with my arthritis. But recently the old gassy, bloating symptoms have returned. Eliminating FODMAP foods seems like a very logical direction to go, but at this point I am just tired. I’ve been taking proton pump inhibitors way too long, but when I try to stop, the pain is excruciating. I vacillate between the joy of discovering and addressing intolerances and the despair that my gut will just never get well. Sounds really tough! I’m sorry you are so discouraged. As someone following a very restricted diet, I totally understand the mixed emotions. Is there a way to slowly wean off the PPIs? Of all the Paleo books out there, Practical Paleo has the most thorough protocol for healing the gut and digestive support (including supplements you can take to help get your gut healed which should help get off the PPIs). I hope this helps! Thanks for such a wonderful post! 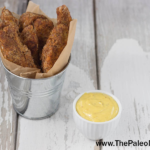 I am just beginning the AIP from Practical Paleo. I didn’t eliminate FODMAPs right away because I was hoping I would do ok. Well, I made the AI friendly banana pucks and macaroons and I’ve been in trouble for two days now. I’m feeling a bit confused because there are many FODMAPs I can tolerate just fine, but a few from different categories that I react to and then there are the leafy greens which are not FODMAPs, yet they go right through me. How can I tell if it’s a stomach acid issue or fodmap issue? Thanks! The issue with the leafy greens is insoluble fiber, which is a little different than FODMAP sensitivity. If they go right through you, I would definitely avoid eating them! You will probably digest them better after your gut has healed and you have better types/amounts/location of gut microorganisms. As for reciting to some FODMAPs and not others, you might be differently sensitive to different types of FOMDAPS. I’m pretty good with fructose and polyols, but not so good with inulin fiber. But if I eat a lot of fuctose, then bad things happen too. This would make it harder to figure out which foods are okay for you and which aren’t because many of them will have different amounts of the different types of FODMAPs. And then add insoluble fiber to the mix, which then makes it even more complicated since many sources of FODMAPS also have some insoluble fiber. The only thing you can really do is systematically go through the diffrerent fruits and vegetables and keep notes on which ones agree with you and which ones don’t. Also, many people with autoimmune disease are very sensitive to sugar. So that might actually be the issue with the banana pucks and the macaroons. I’m sorry there isn’t an easier answer here. It can take a while to figure out where your individual tolerance is. Thank you for your thoughtful reply. I do have hope that I am at least on the right path. Thank you for your insights. I have endometriosis and PCOS which being primal has done wonders for. But yes, it’s time to take it a step further with the AIP. I’ve lost most of the weight I need to and have the last 10 to go of course. That beloved set point/plateau. I can’t thank you enough for your posts. I’ve learned so much. And I keep meaning to comment regarding your podcast, so I’ll do it here. Science with Sarah is always my highlight. Blessings upon you and your family. Hi Sarah, I’m easing into reducing FODMAPS in my diet. The first thing I did was fill up a big spice jar of asafoetida at my co-op. I noticed one blog mentioned that asafoetida contained gluten. I googled it and have found that come up again on other sites. I contacted my co-op. They should be able to tell me if it’s glutened. I’m wondering if this is why I’ve been having pain in my solar plexus area. It could very well be stress. Just thought it would be important that everyone knows that asafoetida can be glutened. Hi. Great read. Very concise and easily explained. I was just wondering how up to date your list was as other sources put kale on the avoid list as it is related to cabbage, broccoli and the other cruciferous vegetables. I know they are constantly researching foods and sometimes they do move around on the list. Thanks. Ditto that this list seems very helpful and that I’ve been finding lots of contradictory information out there on what’s safe at moderate levels and what should be entirely avoided during elimination phase for FODMAP. I see that the post date of this chart was August 2012. Has “PaleoMom” received the updated version from Aglaée? You are amazing! I have been researching Candida, Leaky Gut, Autoimmune Diseases, Hashimotos, etc forever and your information is by far the BEST of the BEST! Thank you for all of your hard work and dedication to this cause. I await your new book, but cannot pre-order as I need the Kindle version, I live in Turkey and sending anything here for the states is painful. Will it come out in a Kindle version? This blog was perfect for me. I have been eating for Candida elimination for the last 6 months and decided to start to add back some fruit since it is season now. I was shocked to become so sick from a few cherries. I had no idea that fruit was a problem for me. Then a week later I tried 1/4 of a green apple – not good! We have nice ripe bananas in our garden and I tried a small one – that didn’t seem to effect me- glad to have the list now to double check before I end of spending the night on the toilet instead of in my bed sleeping!!! You are a life saver! Please keep of the GREAT work! I wish you perfect health and prosperity . HI! Thanks for the info. I am here because I ate a good amt of garlic they other night and thought I was dying! Bad pain, nasusea bloat gas and constipation. I started doing Whole30 in March, it helped my gut dramatically, and now follow Paleo since then. I still get the bloat and gas sometimes however still, tho much better then when I was on the “all american diet”. Anyway the pain the other night has me researching and I wonder if I have a sensitivity to fructans. I seem to be able to process avocado fine and most other foods that fall under the “polyol”. Should I cut out ALL Fodmaps then add back in the polyol’s gradually? Or just cut out the fructans? If I have a problem digesting them should I take a probiotic as well? I currently do not. I need a nondairy probiotic…. By far, far, far the highest fructan foods are from the allium family (onions, leeks, garlic). I would suggest just avoiding those for now but keep the other FODMAPs in mind if you notice any other symptoms. Oh, and the green part of alliums are okay, so you could buy green garlic (looks like a leek) and just use the green part, or use chives, or the greens of green onions, etc. I can eat polyols on a rotational basis. I have a lot of trouble with fructans and am wondering if there is a particular enzyme that is best to help digest them? Thanks! Great article! Love all of your stuff! Try plant enzymes (there’s a link to a good one in my a-store, link in the sidebar). I can eat huge amounts of FODMAPs now that I couldn’t handle before because of them. I remember you suggesting these enzymes but didn’t realize you had previously had FODMAP sensitivity yourself, that’s helpful to hear! What FODMAPS were your most sensitive and how long did you remove them? Or did you go straight to the enzyme supplement? I’ve always been jealous of the beautiful plates of veggies you post when you take a pic of your meals, OH how i’d love to be able to do that again! Thanks for all your work/research/posts! Is palm shortening okay on the fodmap intolerance diet? Any pure fat should be fine. The SIBO recommendations aren’t validated by the scientific literature, so I would recommend starting out with FODMAPs (which are well studied). But I do think it’s a good idea to cut out rice and popcorn and try to stick with starchy vegetables and some fruit for your carbs (much more nutrient dense). Okay, brain freeze. I’m on the AIP but am also pretty sure this might be an issue for me too. That doesn’t leave a whole lot of vegetation left to eat – especially at this time of year in the UK. Hi Sarah! Does the way in which veggies/fruits are cooked/prepared change the sugar content and thus effect the way we react to it from a FODMAPS/SIBO point of view? Just wondering because I bloat up more readily eating roast starchy veggies such as sweet potato than the same veggies in say a blended soup. 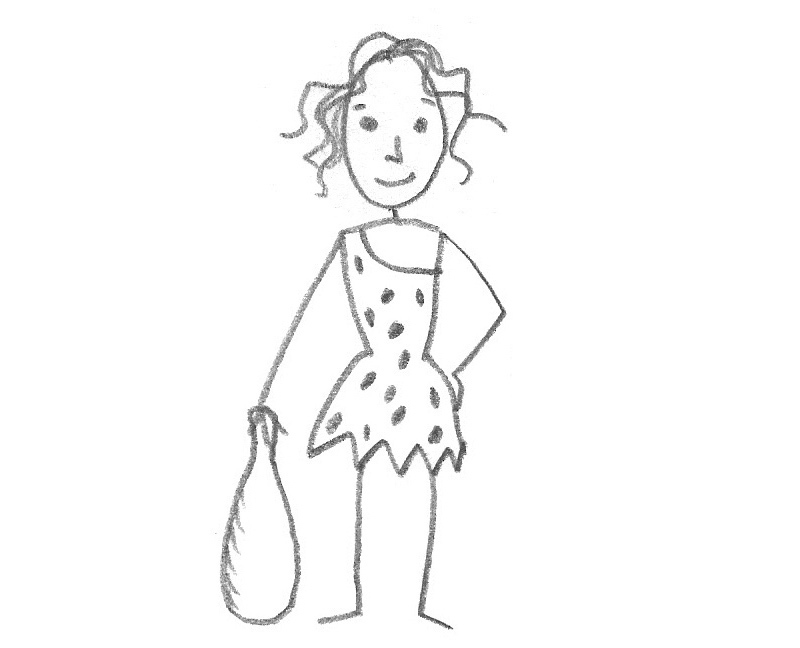 Hi Sarah, I am thinking of starting the Paleo diet for an auto-immune condition. It all seems very overwhelming, but promising. Do you know of any person or organizations that I could contact that would be able to assist me in setting up an acceptable food list and just give me direction? Thanks so much for all your hard work! Your website is incredible! I’m launching a consulting company next month. In the meantime, I would suggest contacting Mickey Trescott of autoimmune-Paleo.com who is a certified nutritional therapy consultant. My book will also have complete food lists (and will be out just two weeks from tomorrow). You could also try the facebook group The Paleo Approach Community. I had always thought my severe FODMAP was from potential SIBO…but…it would appear then that they can be separate entities? So perhaps why my repeated (four times) tx of perceived SIBO with strong antibiotics, has not eliminated my severe FODMAP intolerance? Hmmmm….I had “thought” adding back onions and garlic had been ok, but repeated consumption = not good at all. Cabbage is an absolute no go…as is any vinegar and any squash (even spaghetti squash). carrots, zucchini, and spinach remain my safe zone…still unsure about nightshades and inflammation in my neck. Hmmm…. From my understanding, FODMAP diet says more than just avoiding pistachios. 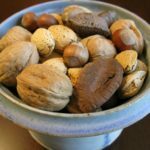 It also says to avoid cashews all together and to greatly limit all other nut intake (think general guideline is no more than ~2 tablespoons in a sitting). Is soy lecithin isolated free of phithostrogen and allergens tha would be safe for people with leaky gut . I feel that if that the case would be helpful to have the soylent (food replacement ) to help the diet . Have you heard of it ? and what you think ? My understanding is that soy lecithin does not have phytoestrogens or the more common allergens (although sensitivity to lecithin is still possible), however lecithin by itself can contribute to a leaky gut, so taking it in supplement form is not something I recommend (I have not heard of soylent). Very interesting, and something I realize I have to try. (Bad pains/bloating most recently after foods with…garlic! jerusalem artichoke!) I’ve been avoiding legumes for some time, along with gluten, but still have occasional post-dinner experiences…and realize it could well be the FODMAPs. I’m fond of making chicken soup…any suggestions for what one puts into it besides carrots and parsnips? Chives, perhaps? I’ve always been a fan of onions, but ready to try. Is cilantro ok? Parsley? I don’t feel great after dill–is this also a FODMAP? Winter squash is just a maybe? Along with avocado? The green part of leeks would be really good in chicken soup. I believe parsley and cilantro are fine. I don’t know about dill. With many of these foods, it’s a concentration versus sensitivity formula, so cooked tomatoes concentrates and why there are so many maybe foods. Unfortunately, you have to experiment. I use the greens of green onions for making stock, as well as a small amount of celery. Thank you, @ThePaleoMom and @J.W. Gardiner! I actually had already made it last night before seeing these comments. I used carrots, celeriac (thinking that perhaps the root would be better than the green? ), parsnips, rutabaga, cilantro, pepper, cayenne, and chives. It was good, and the first time I didn’t feel bloated after eating the soup (which I’d always attributed to it being lots of water!) I will try the green onions and leek greens at some point as well, and may use them for a crockpot recipe instead of onions for later this week. Very informative post. I recently came to realize that I am on the FODMAP intolerant list. I was so confused why a good doze of onion, garlic, and fermented drinks make me sick in my stomach. I even looked up onion intolerance and the like to see if this was a known condition. This is a really great, clear, explanation of FODMAP’s. I’m interested by your suggestion that they could eventually be reintroduced. I find that I can have a FODMAP once – for example, a dinner with garlic in it – and not melt down. However, if I repeat for two or more days, its blimp city for me. Perhaps I haven’t taken long enough off. I do worry about not getting enough veggies, I mostly eat lettuce, and carrots in my soups. Interestingly, my parents have told stories about when I was a breast-feeding infant – if my mom consumed onions, I would get gassy and fussy. I think that may be a suggestion that the FODMAP intolerance is pretty fundamental to my make-up and may be unlikely to resolve completely. Now that I have a pretty good understanding of what my body wants, I can at least keep it from self-destructing. Hi! I just made the pumpkin (well, acorn squash) gingerbread muffins as a treat for my kids. I had one–they are very good! Then, I started wondering where blackstrap molasses falls on the FODMAP list. I didn’t see it on there; perhaps I missed it? It’s probably safest to stop with one muffin, just in case. If you have any information on molasses, I would appreciate it. Thank you! When juicing, should we follow the same rules? Thanks! Hi Sarah! I know I have an issue with FODMAPs, especially onions or when I eat too much of them altogether. I just read the Paleo approach, and I don’t find it too restricting as I love vegetables and meat. But if I have to cut FODMAPs, there’s not much left. I’m wondering if I have to cut out FODMAPs to heal my gut when I know I have an intolerance, or if it’s possible that FODMAP symptoms will subside eventually as I heal? Thanks! Amazing, theoretic as well as practical book you have written!! I’ve been living a Paleo lifestyle for a year, and have done AIP for a month. I feel great, but I also feel I have more weight to lose (maybe 5-8lbs), AND I have a small rash near my nose that I haven’t been able to get rid of (started a few months ago). I have no digestion issues whatsoever. Should I even bother removing FODMAP’s? I am so confused and depressed with all the info I’m trying to put together, please help!!! I started the AIP diet with no FODMAPs a few weeks ago. AIP because I have a rare autoimmune disease called Churg-Strauss, and no FODMAPs because I noticed I was having a hard time digesting some of the items on the list (onions, garlic, broccoli, cauliflower are the main ones). And I thought FODMAPs caused SIBO, but now I found out that’s not the case by reading some of the posts on the two subjects. The reason I was reading the posts is because since I started the AIP and no FODMAPs diets, I’ve become constipated (yes I was on the post about that too and got totally confuse about soluble vs insoluble fibre too). I’m not sure what I need to eat to help relieve the constipation. Right now I’m using supplements to help. I was on docusate sodium, then I added senekot. Then the pharmacist told me to go on polyethylene glycol 3350. I’ve tried it for three days now and hasn’t really done much. I’ve read that I should try milk of magnesium? What about diet – should I be increasing insoluble fibre or soluble fibre, should I be reducing starches and sugars??? I have probiotics, but maybe I should take more than one pill a day. I also plan on making coconut kefir yogurt though that might have sugar in it too. I should mention that I’m on 10 mg daily of prednisone and take 40 mg daily of pantaprazole to reduce acid from the prednisone. I also take 50 mg Amitriptyline, 450 mg pregabalin, 150 mg azathioprine, and 1500 mg valproic acid. I also have to drink three americanos in the morning to get through the fog in my head from the pregabalin so I can take care of the kids and drive them to school / daycare. I was doing ok with BMs with all those meds, but only started having issues after I started the new diet. I’m sure some of these meds don’t help. I talked to my doctor about stopping the pantaprazole. She says to go ahead, but my pharmacist said to stay on because of the prednisone. It was prescribed by the original specialist that diagnosed my illness and who prescribed the prednisone as well. Here’s another confusing bit, sauerkraut is mentioned everywhere as a great food for the AIP diet, but it’s on the “caution” list for the FODMAPs. I eat it every morning for breakfast and though I should maybe up the amount I eat daily if it’s suppose to help balance the bacteria (because it’s a probiotic). So I’ve got digestive track issues I want to resolve and illness symptoms and pain that I would like to alleviate, plus putting my illness into remission. The digestive track issues I think I could get immediate feedback once I get the diet right. I might even be able to alleviate illness symptom (mostly fatigue) and pain (peripheral neuropathy from the illness – fancy way of saying nerve damage in my lower limbs). But as far as putting my illness into remission, I don’t think I would see that since the illness is currently under control with medication. Ok so long post, I apologize. I’m sure I’m missing things I wanted to ask. I hope you have some guidance for me. I noticed that cherries are high FODMAP due to the polyols. Do you know if a fermenting process would change the polyol content? I am thinking of water kefir. I add various friuts to the 2nd ferment and was thinking cherry juice might be nice and tasty. I know that the fermentation process converts fructose, but am not sure if it has any effect on the polyols. On various lists I have seen almonds and cashews on the absolute no list and on the be careful list. Has there been an update? Thank you for all of the information! I always read conflicting information on coffee. I see the chart shows coffee – regarding the caffeine on the “be careful” column. I love the taste of coffee and drink 2 cups of decaf in the morning (organic, swiss mountain process decaf). What is your opinion on the type of decaf I drink…should I stay away from all forms of coffee for a while? Thank so much!! You said in your post that you may not know the difference between SIBO or FODMAP sensitivities unless you get tested. What tests would you need to get done? Thanks! Thank you for getting back to me! I have read that post but it doesn’t actually say what tests are needed to differentiate between the two. I started the AIP diet a few months ago. I noticed while reading up on the diet that I had intolerances to some vegetables in the FODMAP group. So I eliminated high FODMAP foods. Since then I’ve had so many gastrointestinal issues every time I’ve tried eating the smallest amount of anything on the FODMAP list. It’s gotten to the point where I’m seriously considering going a step back to the Paleo diet because I never had such issues before. Anyone else gone through that? Thanks for the reply Claire. It’s good to know that I’m not the only one with this issue. Is water kefir ok on low fodmaps? Can you please explain what cooking with cast iron does? I almost exclusively cook with it. Thank you. My daughter has had liw ferritin levels for a long time and traditioal iron didnt help. When we went to the mayo clinic she saw several providers/specialists and they all suggested she take nova ferrum…they said it is better when your ferritin levels are low. We have to order it…but they warned us that we probably would have to. Blessings! The link for the FODMAP table is no longer valid. Please try this one. I have tested positive for SIBO and am on the Elemental diet. I reacted to the vitamins and large doses of honey. I don’t eat many carbohydrates, including honey so my body was not used to it. I almost always get nauseated from B vitamins. My doc has switched me to the higher fat mixture, which I somehow lost track of – brain fog! So the idea now is to take less of the multivitamin, supplement with a good mineral combination, extra electrolytes – a homemade version without sweeteners, and switch out half the honey with coconut oil for energy. Just in case anyone else needs to get rid of SIBO and does not want to go the antibiotic route. Regardless of the initial treatment, it has to be followed with a very strict diet that is very similar to the FODMAP plan. Everyone reacts differently and sometimes a little wise tweaking is necessary. For comparison, here is the link for the post treatment SIBO food list. Can you clarify for me what was the initial treatment for you. How did you know you were ready to change to a maintenance diet? What is your maintenance diet? Thanks! Sorry I wasn’t clear. I am in the midst of the Elemental diet. It is severe. For two weeks I can only ingest (not eat! Bleh) a mixture of vitamins, fat, honey and pure and complete protein powder. It is meant to starve the little beasties to death. Because the bacteria feed on a specific type of carbohydrate regular food is limited to items on the safe list, gradually adding food from the cautionary list. (Link above) several months on the very limited list. I eat Paleo with occasional cheats with gluten-free and am already following (largely) the auto-immune protocol so the additional limitations won’t be that different. Ok thanks for clarifying. What was the test you did for SIBO and where can I find out exactly what the Elemental diet is in case I need to try it out (ingredients you “ingest”)? I’m following the AIP, but am having issues with some some veg and fruit that are high in FODMAP. So I’m not sure if it’s FODMAPs or SIBO for me. My doc told me about SIBO. I read a little about it here but she has had several people test and treat for it. She gave me a kit that measures gases. You breathe into the tube and there are little glass vials attached (one at a time). Then when all the samples are collected – every 20 minutes for 3 hours – and labeled, you send the box off to the lab. In about a week the doc gets the results and you decide which course to take. My doc suggested I try the Elemental diet because I am somewhat used to fasting and the antibiotics are harsh. There is another option that takes a month of strict food list, high dosage garlic and oregano oil or goldenseal. The garlic and goldenseal kill the bacteria and the strict diet keep it dead. I did not do this because I just wanted to get it over with. Also, I work with the public and don’t want to stink of garlic! I ordered the amino acid powder online and have a coupon I think you can use if you decide to go that route. I ordered it from Jo-Labs. I bought the vitamins and minerals from my doc, they have to be pure and in capsules because you have to open the capsule to put the contents in the “smoothie”. It is kinda yucky but there are ways to make it better. The non-homemade version is Vivonex and it is very expensive. I go to a naturopath but the research and treatment was done by an Allopath (M.D.). The Elemental diet or Vivonex is used to treat IBS and Crohns as well as people like me, with auto-immune diseases. Curious to know if anyone else has experienced this- I’ve been on FODMAP for 2 days (so far with a great reaction by my GI issues)- there’s just one massive problem: I now can’t sleep. Everything about my sleep patterns is the same and I allot myself 9 hours to get sleep. Except I can’t sleep. I didn’t have any sleeping issues before FODMAP. Ideas? Thanks for the list/link! Many of these things I already do, others I’m not so good at or don’t do at all. I’ve been on the auto-immune protocol for 6 weeks now. Intially, I felt better and my fatigue lessened but the last week I’ve had terrible abdominal pain, gas and indigestion. I haven’t tried digestive aids as I didn’t have the finances but now I can try them. I was wondering if it was a FODMAP problem. I honestly can’t see a way forward with cutting out the foods that are keeping me going at the moment and many of them fall into this list. Should I try the digestive supplement first before I do FODMAP? I used to be normal Paleo before this AIP and never felt as hungry all the time as I do now. I eat a lot of vegetables but still feel so hungry. I can’t imagine cutting out a large part of my current diet. I can’t afford to lose weight. Is it possible I just need to try the digestive aids first? Could I maybe introduce some brazil nuts to curb the hunger pangs? Kathleen, are you drinking a lot of water and/or herb tea? That does help. Are you getting enough fat? I have made up coconut oil/honey/lemon juice and frozen it in ice cube trays. I pop a couple from time to time as a supplement and a little snack treat. I like the flavor of the lemon but you could use something else. When I was on the elemental fast I used natural peppermint and orange flavoring to make it more palatable. Your gut needs to heal and the coconut oil helps, as does gelatin. We make a gelatin using Tulsi tea, honey and pure beef gelatin but you could use almost any liquid to make it. We even tried coconut milk once. I eat a lot of coconut oil and gelatin. I drink lots of water and a fair amount of rooibos tea. I thought coconut wasn’t allowed on FODMAP. And honey. I also have concerns about orthorexia. Doing the AIP and FODMAP together limits a person so much that isn’t it close to an eating disorder? I’ve had anorexia years ago and definitely don’t want to go that route again where I barely eat anything. Kathleen, I am on a very restricted diet due to SIBO. Coconut oil is not restricted. Coconut flakes are limited to a quantity as is coconut milk. I eat every four to five hours to make sure my digestive tract has at least one clean flush cycle (doctor’s orders). You can eat as much as you like during those meals and if you cannot make five hours, you do four. Last night I had a company dinner and used Gather Paleo Entertaining cookbook and a recipe from the celiac site. There was plenty of food and I could eat most of it. I only changed a couple of items. I posted the link for the SIBO/FODMAP food list in an earlier comment, above. Yes, having to cook for other people not doing AIP is extra challenging. There are six in my family (everyone with separate intolerances and allergies), so we often have four dinners to make. It’s a lot of food prep for zero satisfaction. I never cheat, so it’s really frustrating to still be sick after six months of this. :/ I’m glad to commiserate with you, Melanie. I have been diagnosed with Celiac for 2 years now. My doctor has been trying to put me on statins since then too, but I refuse. Says my cholesterol is way too high. I want to control everything natural by diet. I have cut out dairy now too and am trying to limit meats to possibly once a day if that. He said I should incorporate beans into my diet for the protein, but I know that legumes are usually not tolerated well for celiacs. I know you are not a Dr but what is your opinion on this? I know I can’t survive on just fruits and veggies alone. Teresa, all of my counts are better since going Paleo. I didn’t think I would like eating meat as my main source of protein but my body is so much happier. My doc even had to lower my prescription thyroid dosage. Once you are off all grains and using coconut oil, bone broth and whole foods your gut will feel so much better, you will probably find that your body’s weight will even out (I lost weight), and you will have so much more energy. I urge you to get tested for SIBO too. It is a drag to treat and follow up on but healing is the goal. I feel much the same as Kelli. I’ve been on the FODMAPs diet for 3 years now and am concerned about the limited whole foods that I am eating. During this period I have been addressing SIBO, gut healing, digestive enzymes, stomach acid, and colon bacterial undergrowth. Confusions I have relate to some veg that are listed as safe on some FODMAPs lists , but not safe in others. I can tolerate some “moderate” foods and not tolerate many “safe” foods. Of course I am now supersensitive to small amount of these foods, and rechallenging foods, even after all of the above, has not proven benefitial. HELP PLEASE !! I’m curious.. I have a particularly strong intolerance to fructans but not so much polyols. Are there any digestive enzymes in particular you would recommend? Or just a general wide spectrum blend? Thank you so much! I think trying plant enzymes (Thorne Research has one and Enriching Gifts is another good brand) would be the best first thing to try. I’ve been on AIP for about three months now. I’m still having problems and my attempt at reintroductions didn’t go too well. I’m considering FODMAPs. The above list is different to the one in “The Paleo Approach.” Is this a more updated list? It seems more manageable than the one in the book. I have limited finances and can’t eat a lot of meat to fill me up. Also, I’m losing weight and don’t particularly want to lose more. Could I possibly introduce things like white rice to keep my carbohydrates up – being hypothyroid, I don’t want to limit carbohydrates too much and with cutting out starchy vegetables and quite a few fruits, it’s going to be a struggle. We also don’t get plantains here. I’m also often hungry on AIP – get lots of blood sugar dips. Link to original FODMAP document is broken. What do you mean by cream in the table? I normally call cream the sour-cream, but I don’t think that’s what you mean. Do you mean the whipping cream? Thank you in advance! Does cooking high FODMAP foods have an impact on their fructan and polyal levels? It seems like I can tolerate some of the foods when cooked, but not raw. you may want to go check out Monash University and more recent facts regarding FODMAPS and the suggested eating. Some of this is outdated. Hi! I’m going lowfodmap & am aip, but wondering if I can drink the juice from sauerkraut? I want the probiotics. Thanks! 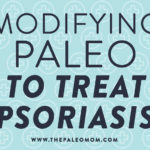 Is Alopecia referenced in The Paleo Approach? Can you adapt this not only for fructose but also for a diabetic as I am both with a Wheat intolerance also! 🙁 really struggling. Also, the link to the FODMAP pdf is broken. I developed symptoms of food intolerance after cancer treatment (colorectal). Before that I ate a varied diet without pain, bloating and misery. Of course one of the methods of encouraging a return to intestinal normalcy is fiber. Methylcellulose. I finally figured out that it was part of the problem. Do you have cancer survivors experience this? Does their gut ever calm down? I keep hearing that cutting out fodmaps should not be a permanent solution because it starves the good and bad bacteria in the gut. The idea is that they ought be excluded for a certain amount of time and then slowly reintroduced. This has not been my experience, but I am interested to know if Paleomom has an opinion on the issue? I’m trying to combine aip and fodmaps, but the question I have is how to eat nutrient dense meals if most veggies and fruits are off the list? I thought, maybe I should just do fodmaps, but I cringe thinking about eating potatoes and other things I know aren’t very good for health. Potatoes are good for health. There is plenty of evidence for this. Just Google posts by Paul Jaminet, Chris Kresser, Mark Sisson, and Dallas and Melissa Hartwig for starters. It opens up one’s diet a lot to include potatoes, including sweet potatoes. They also provide resistant starch which is very good for one’s gut. Going to start reading Paleo Approach tonight, just got it. Thanks so much for sharing your knowledge! I have had digestive issues for years relying on local Doctors advice…..bad idea; “here take this med”. I went Paleo some time ago and could reduce my PPI’s by half. Now I found a great physician in Philadelphia who treated me for SIBO with Xifaxan for two weeks and put me on a low FODMAP diet. I am doing so much better! I was diagnosed with Barrett’s Esophagus years ago and had her do a Upper Endoscopy, she did biopsies and saw irritation but no proof of Barretts. So, I have the go ahead to slowly reduce the PPI’s even more . I am excited! I was going to propose to one of you…….oh that’s right, we are all married, lol. Seriously, thanks for what you do. Hi! Question: If i get an allergy test , I can stop doing the FODMAP diet? And just stick with the ones I got the allergy? The FODMAP link isn’t working. Limiting FODMAPs is not a permanent solution for SIBO. I have been working with a funtional medicine doctor for lyme, mold and gut issues. I have borderline SIBO, but enough to cause me some symptoms. You have to get to the root cause of the SIBO possibly take antimicrobials and deal with motility issues. A SIBO and low FODMAP diet might reduce symptoms but everything I am learning about it says that is not all that you have to do. If you have not figured out the root cause then it will just come back when you re-introduce foods. There is just a lot more to it than that and being on such a restrictive diet for so long is just not a good solution. 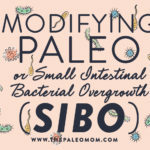 For me lyme and mold exposure has made me susceptible to SIBO. So true Rachel, I have been battling IBS since I was 25 and now 52! I find the hardest part in living in a rural area without very many doctors to pick from and none of them have any answers for you but “Oh you have IBS” “I can’t do anything but give you a drug” The drugs don’t find the cause they usually make you feel worse with side effects. I stopped going to the doctors, I got more out of Sara’s explanation about FODMAPs than even the print out a specialist Gastrologist gave me. I have done so many elimination diets! The symptoms always come back in my case. So so frustrating. I make a living as a pianist, and have had some inflammation in my finger joints. (The first time lasted THREE years, and was cured by a diet change that I haven’t quite figured out yet.) This time, several years later, it’s been 3 months of inflammation. Finally I cut out nightshades and my hands went from 20% to 95% in 24 hours. Yes! I can play without pain. However, I’d like to figure out the last 5%. Any thoughts on which affects the joints more? For the last 15 years I am taking Seroxat 20mg every day. I am 60 years old now. 6 years ago I had a sleeve gastrectomy and lost 40kg. I was soo happy. But 2 years ago I’ve been diagnosed with IBS-D and I am really suffering. The quality of my life has changed, I have abdominal pain every day. Avoid to go to restaurants or social dinners because the moment I eat the diarrhea starts. I took all kind of medications (pain killers, kolestramine, Immodium plus, 2 kinds of antidepressants and Duspataline) but nothing helped the diarrhea although the pain got better. Now I stopped all the medication (except the Seroxat) the pain is back. I am going to try the Fodmaps Diet hope it will help me. Do you think the sleeve gastrectomy is responsible for this?? also I take Ca 600mg. with Vit.D twice a day and vit D3 1000mg. a day. Does this affect me too? I’m wondering where avocado oil falls in this. I don’t like using coconut oil, especially since you’re not supposed to use it on high heat, but I know avocados are not FODMAP friendly, I just don’t know whether making avocados into oil decreases the FODMAP properties. Thank you for all the work that you do. I noticed that the chart lists ripe banana as low fodmap and unripe as concern. 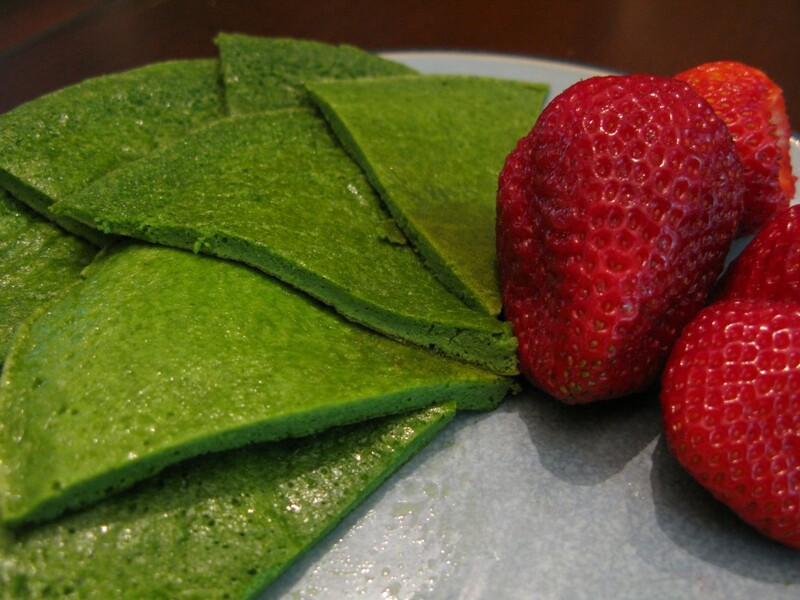 Unripe is low fodmap and ripe is high fodmap according to Monash. This could cause problems for people who are new to the low fodmap diet and don’t realize it’s not correct. Has this been updated yet? We’re just getting started following the FODMAP plan and want to make sure we have it right. Thanks! Hi there! This article has been hugely helpful, along with your information in the Paleo Cure book. 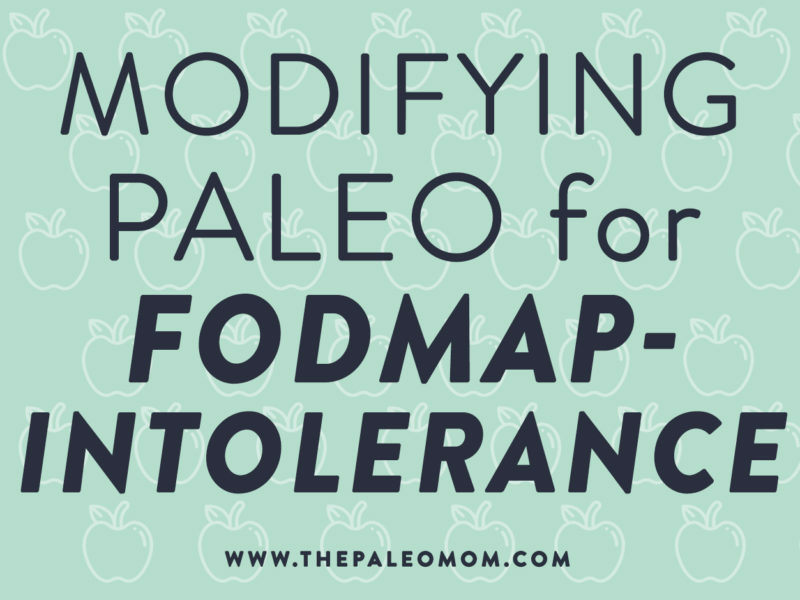 So, our family has been following the paleo diet for the past few months, and we have determined that my husband would benefit from the FODMAP plan for eating. Do you have any cookbooks or recipe resources that you recommend? We are beginning to juggle AIP and now FODMAP and need to find some ways they can intersect for meals, etc. Thanks!